It was a Saturday afternoon in Los Angeles, and I was in my garage with the great Danish pipe maker Jess Chonowitsch, showing him how I cleaned the inside of my pipes. We had three on a table, and I had separated all three — meaning, pulled the mouthpiece out so that each pipe was in two pieces. Just as I brought down the alcohol and tube brushes that we were going to use for cleaning the pipes, my wife called out to say that lunch was ready. Jess was talking about pipes with a stem that is flush with the shank, and by “perfect fit,” he meant that the two appear to be inseparable when together. This was one of the first things I noticed about his pipes nearly two decades ago. 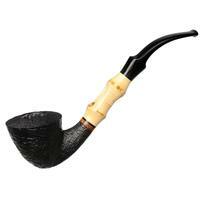 A blind man running his finger along the mouthpiece and shank of a Jess Chonowitsch pipe could not tell which was rubber and which was wood — they were seamless, as if one piece. When you receive pipes in the mail, have you noticed how often the senders separate the mouthpiece from the pipe and send them as separate items in the same box? If it is a Peterson system pipe or any other military mount or push-pull type of mouthpiece, that is fine. But if it is a traditional flush-fitted pipe, I believe they should be sent as one piece. Otherwise, pipes with a perfect fit, if separated for shipping, arrive with a bump when they are put back together. When I have asked pipe sellers why they separate the two before shipping, their explanation is that it is too dangerous, that the pipe is much more likely to break in shipping if it is connected as one piece. However, if you use enough bubble wrap, the pipe is no more likely to break or be damaged, and the advantages are enormous. The pipe makers I have written so much about over the years — Lars Ivarsson, Jess Chonowitsch, Bo Nordh and S. Bang — all send their pipes as one piece and have never had a problem. In fact, Bo used to ask me not to separate the pipe after it arrived for at least three weeks and preferably six weeks. This is because wood expands and contracts depending upon the temperature as well as the amount of humidity or dryness of the air. If you ever get an old pipe that you are afraid to separate because the stem appears glued to the shank, just put it in a baggie in the freezer for a half hour and then slowly open it. The wood contracts in the freezer, which loosens the fit of the tenon in the mortise. When the wood contracts, it actually creates a larger space for the tenon to fit into. Thus, you will be able to open a previously-stuck pipe. 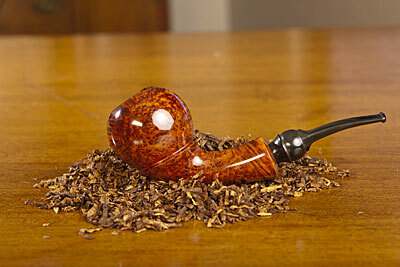 One time when I was at a ranch in Santa Barbara I had left a few pipes on a table for cleaning. They were separated and I got called away for several hours. This was before Jess taught me not to keep them apart for more than a few minutes at a time. They were separated for three or four hours in 90-degree heat that was incredibly dry, and when I tried to put the mouthpieces back together, it was very risky. I was afraid of cracking the shank. So I put beeswax on the tenons and gently twisted them together, but only after waiting until the outside temperature had cooled down quite a bit. If you don’t have beeswax around, just use a bar of soap. Ulf Noltensmeier of the S. Bang pipes gave me that tip, and I have used it many times in hotel rooms over the years. Just take the bar of soap and rub a little on the tenon. You don’t need much, and a little bit on two sides of the tenon will do the trick. Have you ever had your fingers swell up and found it difficult to get your wedding ring off? The solution is to wash your hands with soap so that your finger becomes slippery and the ring slides off much more easily. I remember once flying from Chicago to Miami in January, when it was 10 degrees below zero in Chicago when I got on the plane, and 90-plus degrees in Miami when I got off the plane. I distinctly remember that my wedding ring practically fell off my finger in Chicago, while I needed soap and water to get it off in Miami. Heat expands matter. Have you ever taken your shoes off during a flight and then had difficulty putting them back on because your feet have swollen so much? Imagine what is happening to any pipes that might also be on that flight! Todd Johnson, the talented American pipe maker, once showed me how water can expand the wood inside the shank by applying a teardrop of water to the mortise area on a pipe with a loose-fitting stem. After waiting for a minute or two, for the water to dry, he then put the mouthpiece together with the pipe, and the fit was tight. Prior to that, if I had a loose-fitting stem, I would heat the tenon and then, when it was warm, gently press it against a firm surface to expand the tenon so it would fit. But I much prefer Todd’s way of adding a teardrop of water to the shank. 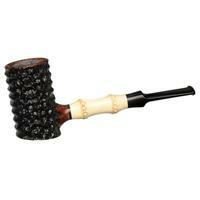 It is so natural, and it does not require permanently expanding the tenon. 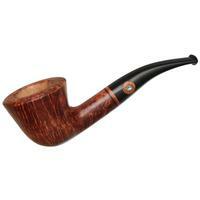 I realize that many old estate pipes have a bump — a slightly raised ridge where the shank meets the mouthpiece — so it’s probably not that big a deal to send them as two pieces. But with all the new artisan pipes being made today, I hope that sellers of their pipes will keep them together for shipment. A related problem occurs if the pipe maker rushes the process, if he makes the pipe and ships it out before the tenon has had a chance to sit in the shank for a few weeks. That is why pipe makers like Jess and Bo always had a dozen half-finished pipes on their work benches at a time. They were letting the wood dry out and form as one with the mouthpiece. When I buy a new pipe that has a perfect flush finish, I try not to separate the stem for at least several months, and never for more than a few minutes at a time. I have found that by being cautious at the beginning, the smooth transition between rubber and wood will be preserved for many years. But the starting point is to make certain that these pipes are sent in the mail as one piece, not two. Rick Newcombe’s new book, STILL SEARCHING FOR PIPE DREAMS, is available from www.sumnerbooks.com. 1. The top photo was the 24th pipe Nanna Ivarsson made in 1995, when she was working alongside her famous grandfather, Sixten Ivarsson, in his workshop in downtown Copenhagen. The shape was originally created by Lars Ivarsson, Nanna’s father, in the 1980s. I saw the pipe in the workshop in rough form and said that it looked like a golfball on a tee, and I ordered it on the spot. I waited many months before receiving the finished pipe, and it was worth the wait. 2. 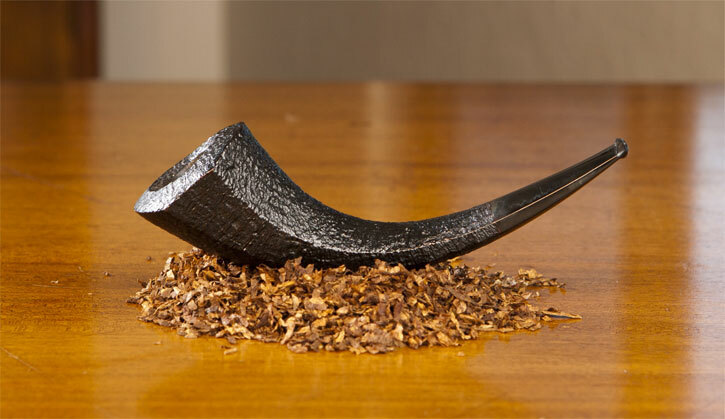 The middle photo is a black sandblasted horn made by Bo Nordh in 1993. This was the first Bo Nordh pipe I bought. It is elegant and beautiful. I paid $1,000 for it new, and today could sell it used for something like eight or 10 times that amount. I would never sell it. I bought the pipe from Peter Heinrichs at his store in Cologne, Germany after seeing a photo in the Pipe Smoker’s Ephemeris of Bo smoking one, sitting in his wheelchair outside his farmhouse in Sweden. 3. The bottom photo shows a pipe in the prince shape that was made in the 1940s or 50s by the famous French department store Hermes. 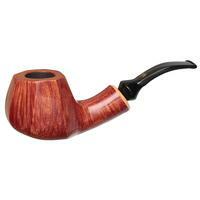 The pipe was not actually made by the department store. They probably commissioned pipes to be made by pipe makers in St. Claude, France that were stamped with the Hermes name. 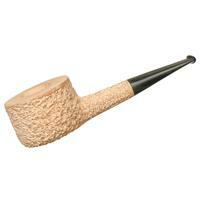 I bought this pipe unsmoked years ago at a pipe show from Steve and Roswitha Anderson of S&R Woodcrafts of Ohio. Very interesting. Something new to remember to keep pipes nice. Interesting, I can appreciate those points. However, not matter how it is packed, if the pressure is exerted on the package and the pipe is one piece, the stem could be snapped. Separated, packed properly and shipped in two pieces, that damage is nearly impossible. FWIW, I’ve never encountered an issue with stem fitment, including pipes sent from the UK to the States. Perhaps I was lucky, but I’ll take my chances and separate pipes I ship (and hope for the same from my seller). I did receive one Upshall, sent in once piece, tucked into an unpadded envelope. Now that’s a whole different story…. Very interesting article, I always learn something new here at PipesMagazine. Thanks for a very helpful and excellently written article; nicely illustrated, and with plenty of good tips that will insure our pipes will be in service for decades to come. and you will find Mr. Low’s remarks at about the 40% mark in the progress bar. A damn fine read. Thanks for taking the time to put these thoughts down. Makes great sense. Great article! I have actually figured this out from buying estates online on my own. I have also found that if the seller send it with the stem connected to the bowl and it is hotter than my apartmet outside that the stem fits best if I put it in the freezer for about 30 minutes and then don’t clean it for 24 hours. It adjusts to my room temperature. I have been considering for the future to only have pipes shipped connected to prevent the problems you mention above as tight stems can be fixed easier than loose ones IMHO. Wow, I learn something new every time I log in. I have two pipes that have stems that won’t go on more than half way. I didn’t think the hot days over the summer had an effect on the wood. I cleaned my pipes in the garage where I spend 80% of my day. So, If I put the pipes in a baggy and place them in the freezer the stem will go to the bottom when I take them out? I’ll try that and see what happen’s.